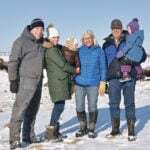 Lorne and Megan Davey run a 200-head commercial cow-calf ranch and small backgrounding operation near Wilkie, Sask., but they also train a few ranch and performance horses as well. 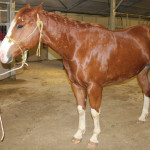 This seven-year-old Palomino passed its physical and was being washed and groomed for the Ranch Horse Sale at the Calgary Bull Sale. Lorne is also general manager of West Central Pelleting Ltd at Wilkie. MJ Wowk and his father Miles, run a cow-calf operation near Myrnam, Alta., east of Edmonton, but they also train a few ranch horses. 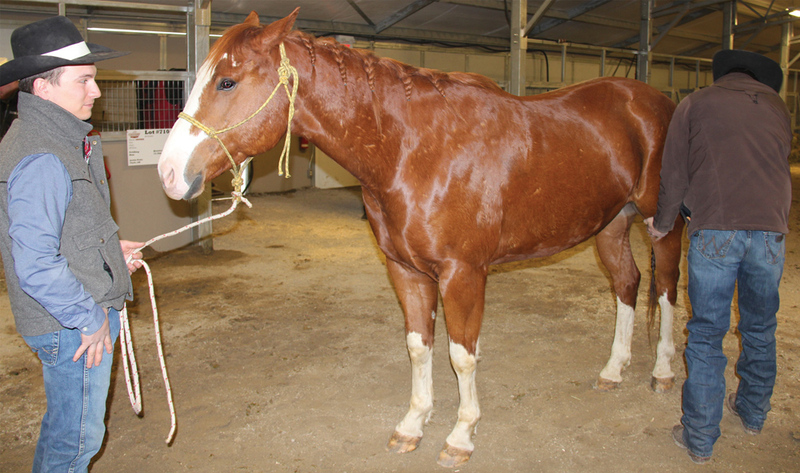 Above, MJ holds the halter on this four-year-old papered Paint horse while veterinarian Ty Corbiell checks out the soundness of the animal before it goes into the ring for the Ranch Horse Sale. 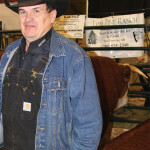 Fitting cattle for the show ring is a detailed operation, says Mike Panasiuk, with Church Ranches, who was getting these two-year-old bulls ready for the show and sale ring at the Calgary Bull Sale. He used a blow dryer and a few strokes of the comb to get hairs of the hide lying just the right way, along with a prayer that nobody lays down and ruins the look before show time. Veterinarian Ty Corbiell, who operates Cor Veterinary Services at Cluny, Alta. 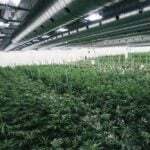 east of Calgary, made sure the dozen animals to be auctioned at the Ranch Horse Sale were all physically sound and in good health. With stethoscope in place, he didn’t miss a beat. 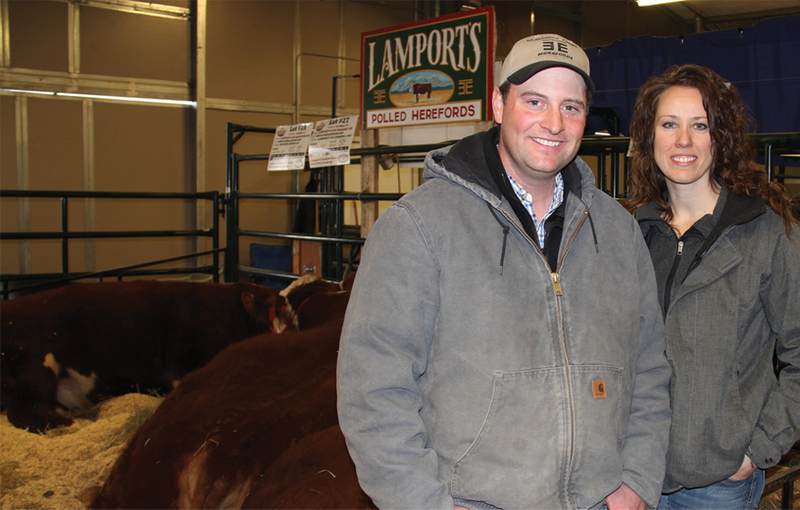 Brad and Christine Lamport run a 150-head purebred Hereford operation in Rocky View County just a few miles west of Balzac, Alta. They had three, two-year-old polled Hereford bulls at the 116th annual Calgary Bull Sale. 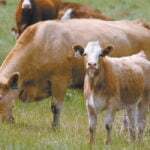 Along with Herefords they also raise a few Speckle Park cattle. Along with the Calgary event and some private treaty they also bring bulls to the Lacombe Bull Sale — the 107th annual sale is coming up April 12, 2016. 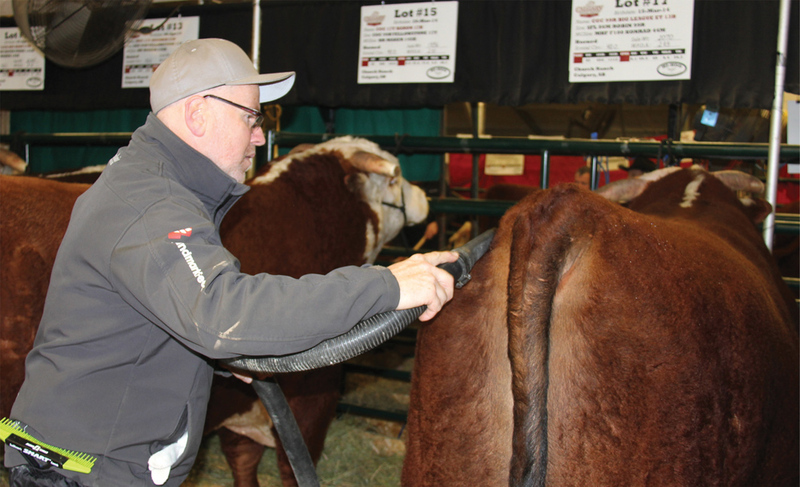 Bruce Butler, who along with his wife Karen operates Lone Pine Ranch, brought two coming-two-year old Hereford bulls to the Calgary Bull Sale. They run between 100 and 120 purebred cows on the farm at New Norway, just southeast of Edmonton. 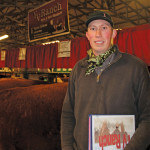 It was his first time at the Calgary Bull Sale, although they have been showing and selling cattle at the Lacombe Bull Sale, coming up April 17, for about 20 years. Along with bulls they also sell replacement heifer. 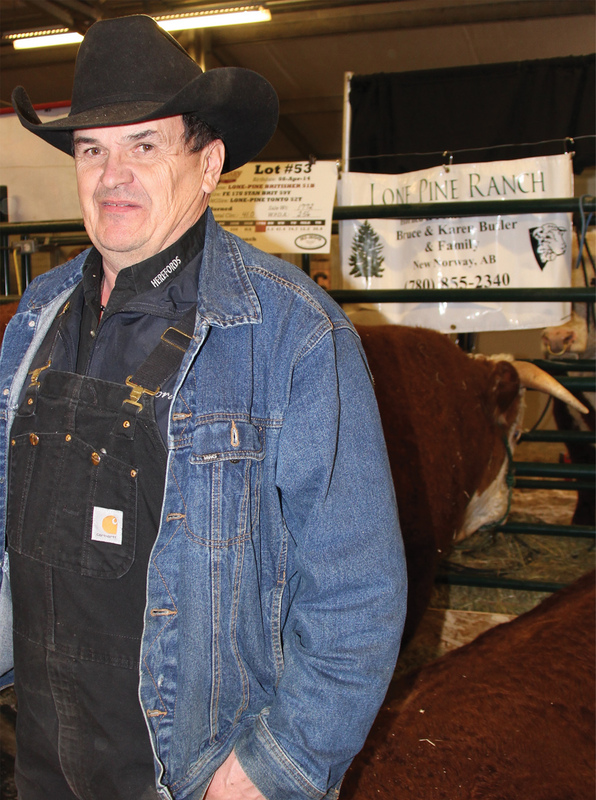 Hal Nixdorff of YV Ranch near Airdrie is among a long line of Nixdorff families producing purebred cattle. YV Ranch had eight horned bulls including seven two-year-old bulls and a bull calf up for offers at the Calgary Bull Sale. 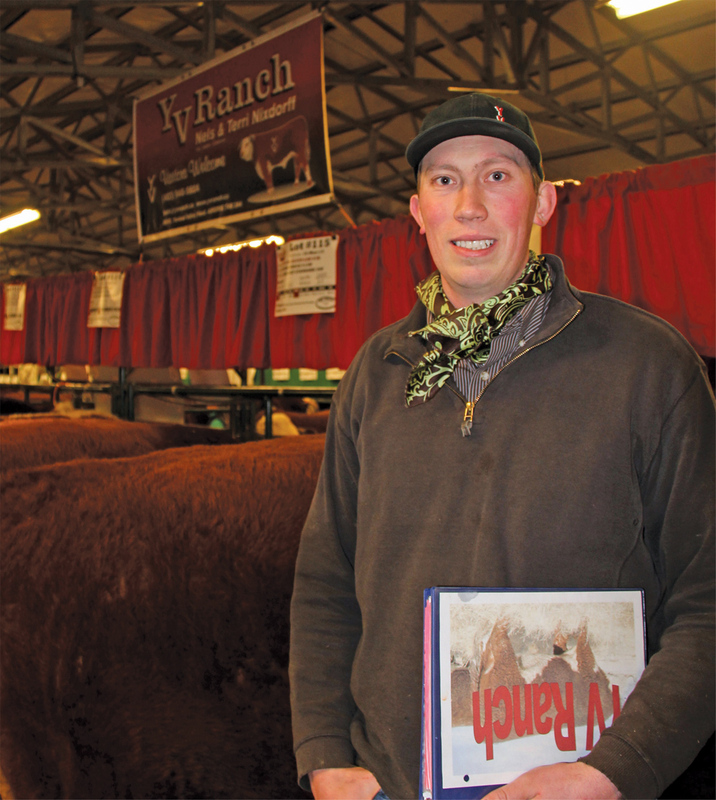 The ranch has been attending the sale for 30 years. 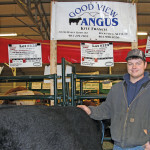 He’s not the biggest beef operator in the country, but Kyle Francis, 24, says he is working on building his purebred Goodview Angus herd. Born and raised on the family farm at Indus, just east of Calgary, Francis says he started raising cattle when he was nine. 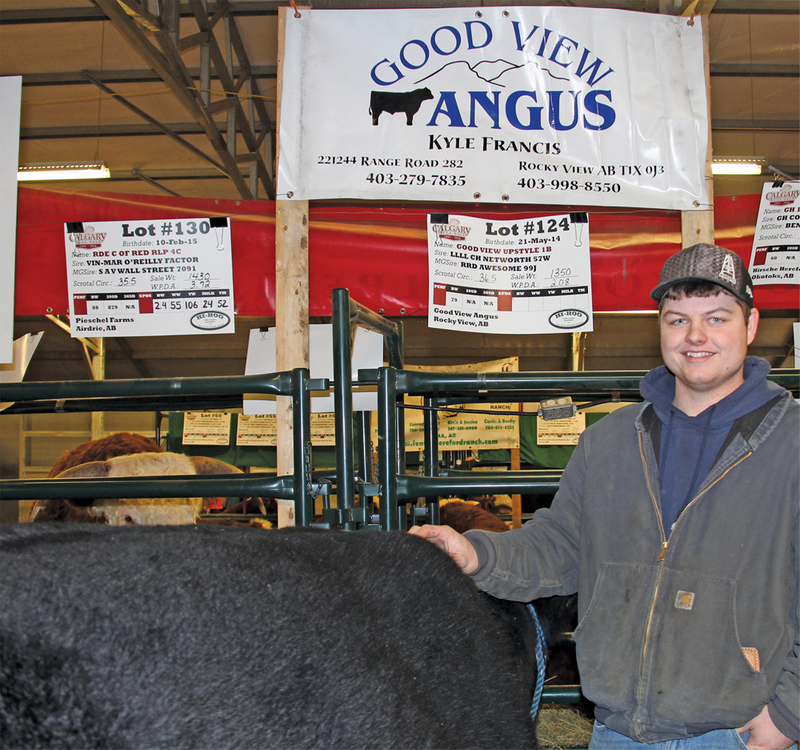 Although he only has eight head, he is planning to take the proceeds from the sale of this long- yearling Black Angus bull and buy some bred heifers. Breeders were optimistic the opening morning of the 116th Calgary Bull Sale, held in early March at a totally new venue in the barns of the Century Downs Racetrack, at Balzac, just north of Calgary. 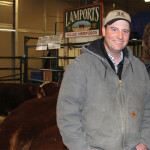 While the full story would be told over the next couple of days, once the auctions actually started, the 25 Hereford and Angus bull consignors were feeling pretty good that prices would hold this year as commercial cow-calf producers look to improve or expand their herd numbers. 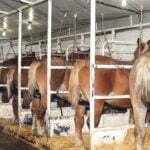 If nothing else the access and parking was way better at Balzac than trying to negotiate trucks and trailers into the always busy and congested parking lot of the long-standing show barns at the Calgary Stampede Grounds. While billed as horned cattle sale, there were several polled Herefords in the stalls tended by about 20 consignors, as well as a few head of black animals from four Angus breed consignors. 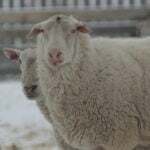 And if you needed to improve mobility around the farm, there were also about a dozen prime-looking well-groomed, and fully trained ranch horses from different ranching operations across Alberta as well as Avonlea and Wilkie, Sask. I’ll try and get sale results for the next issue of Grainews, but here are a few faces of those participating in the 2016 show and sale.